In the video, we discussed the value of exercise with respect to your mental health. Don’t take it for granted. Simply adding an exercise program to your daily routine can significantly improve your brain health. Here are some additional guidelines for physical wellbeing. How well your body functions affects your ability to accomplish your daily activities. Sedentary behavior—which usually means sitting or lying down while awake—has been linked to a shorter lifespan and a wide range of medical problems. Any time you get up and move, you’re improving your chances for good health. Take the stairs instead of the elevator. Park your car at the far end of the street or parking lot. Have “walking meetings” with colleagues at work. Rearrange your home so you can stand upright or walk on a treadmill while watching TV or using the computer. Set an alarm on your computer to go off every hour and prompt you to move around for a minute or two. 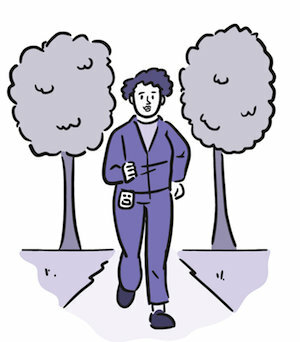 Try walking as if you’re already late for the bus or an important meeting. Have small weights in your office or around your home for doing arm exercises. Your muscles, bones, and joints all work together to make your body an amazingly movable machine. Like any machine, your body can suffer some wear and tear. It needs regular care and maintenance to keep moving with ease. Maintain a healthy weight. Too much weight can make your knees and hips ache. Engage in muscle strengthening (resistance) activities that involve all your major muscle groups two or more times a week. Stay active all week long. Aim for 150 minutes of moderate intensity activity a week, such as brisk walking. Wear comfortable, properly fitting shoes. Eat a well-balanced diet. Get enough calcium and vitamin D daily to protect your bones. Try to avoid lifting heavy objects. If you need to lift something heavy, bend your knees and keep your back straight. Keeping your body at a healthy weight may help you lower your risk of heart disease, type 2 diabetes, and certain types of cancer that can result from being overweight or obese. Take charge of your weight and your health. Click here for the Body Weight Planner. Select a mix of colorful vegetables each day. Go easy on fats and oils. Stick with activities you enjoy. Go for a brisk walk, ride a bike, or do some gardening. Get active for just 10 minutes, several times a day. Every little bit counts! 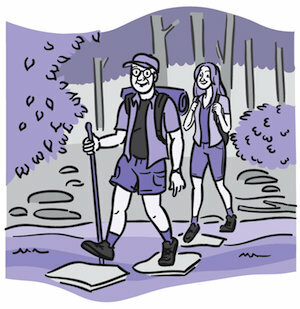 Keep a food and physical activity diary. Be realistic and aim for slow, modest weight loss. Your metabolism changes as you get older. You burn fewer calories and break down foods differently. You also lose lean muscle. Unless you exercise more and adjust your diet, the pounds can add up. Middle-age spread can quickly become middle-age sprawl. Carrying those extra pounds may be harming your health. Commit to a healthy diet. Move more. Take the stairs and add walking breaks to your day. Limit alcohol use. Alcohol is high in calories and may worsen health conditions common among older adults. Avoid tobacco products. When you quit smoking, you may improve many aspects of your health and are likely to add years to your life. We make dozens of decisions every day. When it comes to deciding what to eat and feed our families, it can be a lot easier than you might think to make smart choices. A healthy eating plan not only limits unhealthy foods, but also includes a variety of healthy foods. Find out which foods to add to your diet and which to avoid. Limit “bad” fats. Reduce saturated fats and trans fats in your diet. Use olive or canola oil instead of butter, stick margarine, meat fats, shortening, or palm oils. Cut back on sodium. Use fresh poultry, fish, and lean meat, rather than canned, smoked, or processed. Choose fresh or frozen vegetables that have no added salt and foods that have less than 5% of the Daily Value of sodium per serving. Rinse canned foods. Choose more complex carbs. Eat more complex carbs, like starches and fiber. These are found in whole-grain breads, cereals, starchy vegetables, and legumes. Cut added sugars. Pick food with little or no added sugar. Use the Nutrition Facts label to choose packaged foods with less total sugar. Get more fiber. 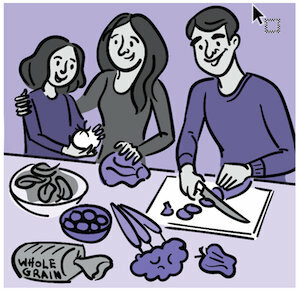 Switch to whole grains and add different kinds of vegetables, beans, nuts, and seeds to your diet. We know that making healthy choices can help us feel better and live longer. 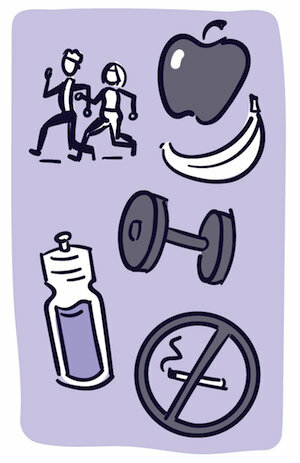 Maybe you’ve already tried to eat better, get more exercise or sleep, quit smoking, or reduce stress. It’s not easy. But research shows how you can boost your ability to create and sustain a healthy lifestyle. Plan. Identify unhealthy patterns and triggers. Set realistic goals. Change your surroundings. Find ways to make healthier choices easy choices. Remove temptations. Work for changes in your community, like safe places to walk. Ask for support. Find friends, family, co-workers, neighbors, or groups for support. Fill your time with healthy activities. Try exercise, a favorite hobby, or spending time with family and friends. Track your progress. Record how things are going to help you stay focused and catch slip-ups. Imagine the future. Think about future benefits to stay on track. Reward yourself. Give yourself a healthy reward when you’ve achieved a small goal or milestone, like a massage. Be patient. Improvement takes time, and setbacks happen. Focus on progress, not perfection. JAMA Psychiatry. 2018 Jun 1;75(6):566-576. Association of Efficacy of Resistance Exercise Training With Depressive Symptoms: Meta-analysis and Meta-regression Analysis of Randomized Clinical Trials. Gordon BR, McDowell CP, Hallgren M, Meyer JD, Lyons M, Herring MP. The Effects of Resistance Exercise Training on Anxiety: A Meta-Analysis and Meta-Regression Analysis of Randomized Controlled Trials. Samuel B. Harvey , F.R.A.N.Z.C.P., Ph.D., Simon Øverland , Ph.D., et. al.